What a great giveaway! Thanks for the opportunity! :) Happy New Year! Awe, I love washi tape; I’d love to win! Hope you start the New Year with a huge smile on your face! Ooooo please please please let me win this pretty giveaway! What an exciting giveaway. I love washi tape. What a wonderfully washi way to ring in the New Year!! oh miss Keren…i get all kinds of jittery looking at all of these amazing washi tapes…i guess this is as close to an addiction as i get…i need all of these stripes…polkadots…flowers…colors and more…now now now : ) lol!!!! what an incredible give away — WOW!!!! thanks for always surprising us and making us happy happy!!!!!!! : ) HAAAAAAAAAAAAAAAAAAAAAAAAAAAAPPY New Years to you and yours…filled with love and hugs of course! Washi tape I need more, you never have enough. WOW! that would be AMAZING to win! I have bought a few tapes from them before and they’re the best! Wouldn’t a prize like that make a great start to the year! Thanks for the chance to win. I do love me some washi tape. Thanks for letting us know about the giveaway! I still haven’t seen this stuff in person so I think I need to win! ;) Thanks for the heads up! WHOA BABY! What a great giveaway! Thanks for the chance, and Happy New Year! I’ve never tried Washi Tape but everyone seems to love it. Thanks for a chance to win it! I’ve never used washi tape, but I want to try it SO BAD!! All those rolls of COLOR can ONLY put a SMILE on your face! I would use this tape for a journal. This looks so beautiful and would be lots of fun! Those colors remind me of spring, beautiful! Happy New Year and thank you for your wonderful ideas. I also would love to win the washi tape. WOW ~ I just Freckled Fawn on Pinterest and ordered the wood arrows and after I sent the order I saw the washi tape and wanted more!!! Love it! Thank You ~ Happy New Year. Thank you for this wonderful giveaway. Happy New Year to all. Happy New Year to you and your loved ones! Thank you for a chance to win this great prize! WOW! What a fun giveaway! Thanks for the opportunity! Wow……so cool, Somebody (maybe me??) is going to be a very happy winner. Thank you for offering this. Wow, with that much washi tape, I’m going to make a washi tote bag. What do you think, lol? Such a generous giveaway. Thank you and Happy New Year! Yeah…that would be awesome!! All that washi….drool!! 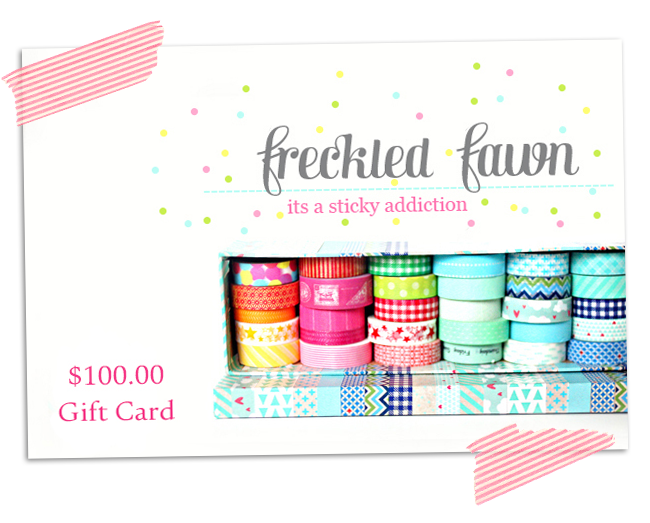 I would LOVE to get $100 to Freckled Fawn! Thanks for the opportunity! Wow, what a great giveaway! Thanks for the chance to win. $100 dollars of awesomeness! Freckled Fawn is one of my favorite online shops!! One can never have too much pretty tape. Happy New Year to one lucky person! I love washi and I love Freckled Fawn! Thanks for the chance! What an awesome giveaway! thanks for the chance and happy new year! Great giveaway. Now what would I do with that much washi tape??? Have a whole heck of a lot of fun! Thanks for the chance to win! Holy Moley!!! Now that is a giveaway!!! What a nice giveaway, thanks!! I would love to win! I’m somewhat new to the washi tape club, but I used it on some tags for Xmas, and it was love. :) Happy New Year! WOWERS talk about hyperventilating! This is one insanely awesome giveaway. LOVE Freckled Fawn & how much fun would this be to win. NOW that is a way to start the New Year w/a BANG! Thanks so much for the chance. Wow, what a great way to start the new year! Thank you very much and Happy New Year! what an awesome giveaway! I LOVE freckled fawn washi tape! Washi tape! My current obsession. Thanks so much! You can never have too much washi tape .. and I adore Freckled Fawn !! Thanks so much for the chance to win !! Thank you so much for the opportunity. Happy New Year! Awesome giveaway! Happy new year! What a wonderful giveaway!!! Thanx!! Oh, the things I would decorate! I am a HUGE Freckled Fawn fan! Thanks for the awesome giveaway & happy new year!!! Great giveaway! Thank you so much – I love your products!!!! So generous and totally awesome! Would love to win. Thanks!!! Amazing giveaway!! Winning this would be so fantastic! I have a major Washi tape addiction that could use a bad influence ;) Thanks for the fun contest! I would LOVE to win it! Thanks so much for the chance!! I think Washi Tape is a great way to start the New Year! Thank you for the AMAZING give-away! I love washi it’s my new scrappy addiction! Wow, great giveaway! Thanks fora chance! I really love anything when it is free but I love the one with an owl on it. Wow..what an amazing giveaway and the perfect start to 2013! Ooh!! LOVE Freckled Fawn!! Thanks! Such fab tapes,thanks for the chance to win! What a wonderful and generous giveaway!Good luck to everyone! Thank you for the chance to win! what a super giveaway! i hope i win… i hope i win! Oh cool! I just started to get back into scrapping after a couple years and just found out about Washi tape! Would love to win this!! I have not really jumped on the washi tape bandwagon yet, but this would be a wonderful way to get started! I love washi tape!! Thanks for the chance to win! Love washi tape and appreciate your generous give-away! Happy New Year! Yay! Lovely washi tapes! Thanks for a fun giveaway!! I love Freckled Fawn and use their washi tape on much of my packaging. Fingers crossed! Thanks! Obsessed with Washi. Really LOVE it. Thanks for a chance to win. Wow!!! Happy New year! Washing tape is awesome! I can think of at least 100 ways to use this cool tape! Thanks for the chance to win! I have never played with washi tape, though I have read a lot about it and have wanted to try it. This would be a great way to begin a new year! Thanks for hosting! Happy New Year! Washi tape is the best and so is Freckled Fawn! Wow! Love washi tape! Happy New Year! Hi!!! Thanks for the great give a way!!!! Awesome giveaway!! Love washi tape!! Love your blog, its so cute!!!! I love washi tape!!! Thanks for the chance to win. I love Freckled Fawn – they have the best selection! That would be the ultimate way to start the new year! Thanks for the chance to win! Thank you for beeing so generous! This is crazy! What an awesome givaway!!!! Oh, what a generous giveaway! I would love to win! Thanks for the opportunity! ooo I am just getting into washi tape–how cool! I don’t own any washi tape and would love to craft with it. Thanks for this great giveaway! I’ve just become introduced to your shop. Everything is just beautiful! Great giveaway!! I’m doing project life this year and would love some new washi tape! Love, love, LOVE Freckled Fawn! What a fabulous giveaway for the New Year! who doesn’t love washi tape? :) great giveaway! Thank you for such a beautiful giveaway! What a fun give away. Keeping my fingers crossed! Ooooh. I would LOVE to try Freckled Fawn. I’m drooling. I LOVE washi! I would love to win. Would love to Win! Great giveaway! I have become completely infatuated with washi tape. Thanks for such a great giveaway! More pretty things for me!!! What a FABulous prize! I love Washi Tape! Woo Hoo and Yippee Skippee! Love your blog,what great new year giveaway. What an awesome giveaway! I LOVE Washi Tape!!! Wow! What a fantastic giveaway, love Washi! Happy New Year! Wow, what a fabulous giveaway! Thanks for the chance to win. I have only recently discovered washi tape and I LOVE it! I haven’t gotten a collection up yet so this would be great! What a lovely giveaway, thanks for the chance! And Happy New Year! OMG!!! That is an amazing prize. Thanks for the chance and Happy New Year. Wow, what an awesome giveaway. Thanks for a chance to win. Sorry you lost me at Washi Tape! What a great giveaway idea! Happy New Year! I’ve been a customer for quite a while and love your washi tape. Thanks for the chance to win! Happy New Year! Haven’t found washi tape locally and am dying to try it!!! Love this!! What a fun giveaway. Great giveaway! I have just started collecting washi tape! Thanks for the chance to win! So glad I “found” this site, such cute ideas and an awesome giveaway! Whomever wins is going to have a great time with these tapes. Awesome giveaway !! Happy New Year to you !! Awesome ! Would love to win. Great giveaway! I love washi tape! Love freckled fawn’s washi tape! What a wonderful opportunity to win! What a great give-a-way! I need some Washi tape! Wow, what a FUN-tastic giveaway. Just love it. You are so sweet. I love it. Happy New Year!!! Hope it is as blessed as we have been from your site. Love all the clip art. What a fantastic giveaway! Thanks so much for the chance to win! Great giveaway for a great product!! Awesome giveaway… More washi…. I had a dream last night where all my walls were covered in washi. May be this is it… Lol.thanks for the chance. Amazing giveaway, thanks for chance to win! I love browsing Freckled Fawn! And I love their sweet name, too! I love your Washi tapes! Have a happy New Year!! Oh the things I could make with these would be so Awesome Thank you! Awesome giveaway. Just love your website. So pretty. Thanks for this amazing opportunity! :) Happy New Year! Wow! I can’t even imagine being able to buy $100 worth of gorgeous washi tape!!! Thanks for the chance, though! I haven’t done much with tape…but I keep pinning ideas! This would be great to get me going! Thank you so much!! They have such beautiful choices. Wowsers! What a way to start off a year. . . awesome give away! What a joy it would be to have $100 worth of washi! This is an awesome giveaway! I’m thinking of all the different things I could do with the tape. What a cool giveaway! I would love to have more washi tape and yours is the site I always drool over it on. I’ve discovered washi tape and am using it quite often to decorate my envelopes and postcards. Love it! Thanks for having this awesome give a way!! Love your Blog!!! I appreciate your hard work and generosity very much!! What a fun giveaway! I think everybody needs a little Washi tape in their lives. What a great give away. Washi tape is a fun addiction! thanks for sharing to start the new year off with the love of quality products. freckled fawn washi is a great bang to 2013. Hi, what an amazing New Year prize, many thanks. Oh wow, I would love to win that Washi Tape. This is an amazing giveaway! I hope I’m lucky enough to win! I can never have enough Washi tape. Happy 2013 everyone! This is so nice of you all to do. what fun! thanks for the chance to win. Such lovely colors. A fabulous way to start 2013. yay! Karen, you offer soooo many amazing designer graphics for us and now this!!! I feel like washi tape was thought up by fairies! It is fun to use on so many projects! I just needed to doctor a place on my computer where the edge of the casing was starting to come unglued so I used a pretty piece of washi tape to treat the problem. Not only does it keep my hand from getting pinched it looks great too! Happy New Year! Such a great prize. Love Washi Tape, so many great things to use it on…I never have enough. What a fun giveaway- I would love to win! LOVE washi tape! thanks for the chance to win!! Wow! What a great giveaway to one of my favorite scrappy shops! Love it!! Good luck all!! Thanks for the chance at winning. This is my first time here! I will browse around and see what you have to offer! This giveaway is AWESOME!!!! I would love to win this!!! Keep it up with the great giveaways!!! Love your site. I’m hoping this is the place to enter (judging from the # of comments -I’m guessing it is). I would so love to win. Been drooling over Washing Tape since I first saw it – and still have yet to buy any. What a great way to get me started :) Good Luck to Everyone! My spell check changed it to Washing Tape -lol. Happy new year! thanks for hosting such a great giveaway. Here’s to hoping I win this amazing giveaway! Good luck to everyone! Happy Twenty Thirteen! Gorgeous blog! love the colors! I’m adding to my bookmarks! I’ll be back! Amaze-ZING giveaway! Love FF! Washi Tape is my go-to these days…so cute, so easy :-) Thank You!!! I LOVE Washi Tape! What a great giveaway, thanks for the opportunity! wow what an awesome giveaway thanks!! What a fun giveaway!! Thanks for the chance to enter! What a fun giveaway. Thank you! Such a generous giveaway. Thank you.